This week a precocious 14-year old immigrant Ahmed Mohamed wanted to impress his teachers with a clock he made at home. He built it into one of those pencil boxes you buy at a craft store that look like a small brief case. The teachers and school officials thought it looked suspicious and called the police. The police proceeded to arrest him as a terrorism suspect1. This is a technology blog and so I won’t get into the topics of politics, racism, and terrorism. Let’s even set aside the seemingly incompetent reaction of Irving, TX law enforcement who had not evacuated the school. Instead I am going to focus on the topic of STEM education in the United States. 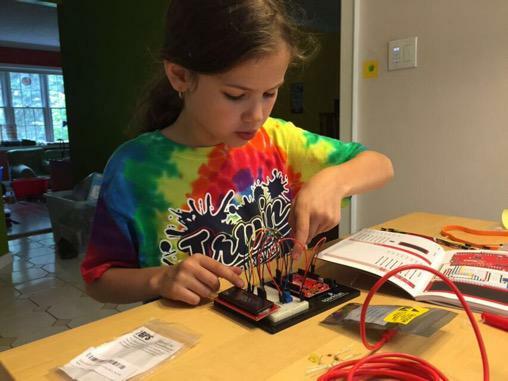 It just so happened that a few days prior to this incident my 8 year old daughter asked if she can bring the Arduino LCD circuit I had built with her to school to show her friends and teachers. I was not even thinking that an elementary school teacher may think a circuit with batteries, wires and a display is a bomb and it may result in her arrest. To tell the sorry state of American STEM education all one needs to do is take a tour of top engineering universities and visit science and engineering classrooms. A keen observer will find that the majority of students are immigrants. These students have multiple advantages over American students — they come from cultures that value knowledge and education, families that invest in their childrens future, and teachers who can a tell a bomb from a clock. Of course, what starts in universities transfers to workplaces. A visit to any software company or even an IT department just about anywhere will reveal that the majority of developers are immigrants as well. They come from India, China, Ukraine, Belarus, Russia, and elsewhere in Asia and Europe. Meanwhile, American politicians draw crowds of people at campaign rallies fanning the flames of fear over American jobs2. The reality, however, is that a much bigger threat to the future of American middle class jobs starts in schools. When teachers, school, and law enforcement officials can’t tell the difference between an explosive and a homemade clock — how can American kids look up to them ?